Really simple and delicious. Works best with really fine green beans. Finely slice the garlic and grate the Parmesan. Heat a thick-bottomed saucepan. Add the olive oil, then the garlic and cook until soft but not brown. Add the tomatoes, season, and add the chilli flakes. Cook over a medium heat for 20 minutes. Trim the beans, then cook in boiling salted water until very tender. Drain well and add to the tomato sauce. Cook the spaghetti in boiling salted water until al dente. 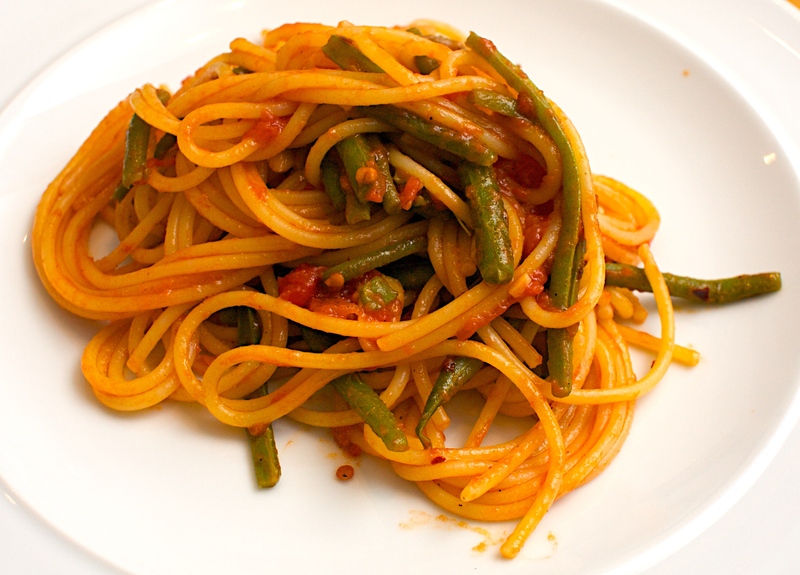 Drain and stir the pasta into the tomato and green bean sauce. Season and toss with a bit of olive oil. Wine Suggestion: Nothing too big and heavy required here, try a dry rosé from Bordeaux.